In the quadrangle of the University of Georgia Marine Institute can be found one of the most interesting pieces of outdoor sculpture in the state and certainly the most famous on Sapelo. Richard Reynolds commissioned a large fountain topped with this large turkey and joined by two smaller turkeys on the ends of the structure. I’ve heard that it was “given” to his wife as a Christmas gift, much to her dismay, but I’m not sure if there’s any validity to that story. 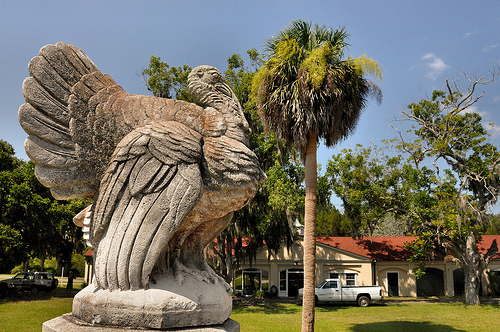 Still, if you make it Sapelo Island, be sure you visit the Marine Institute and the turkey fountain!